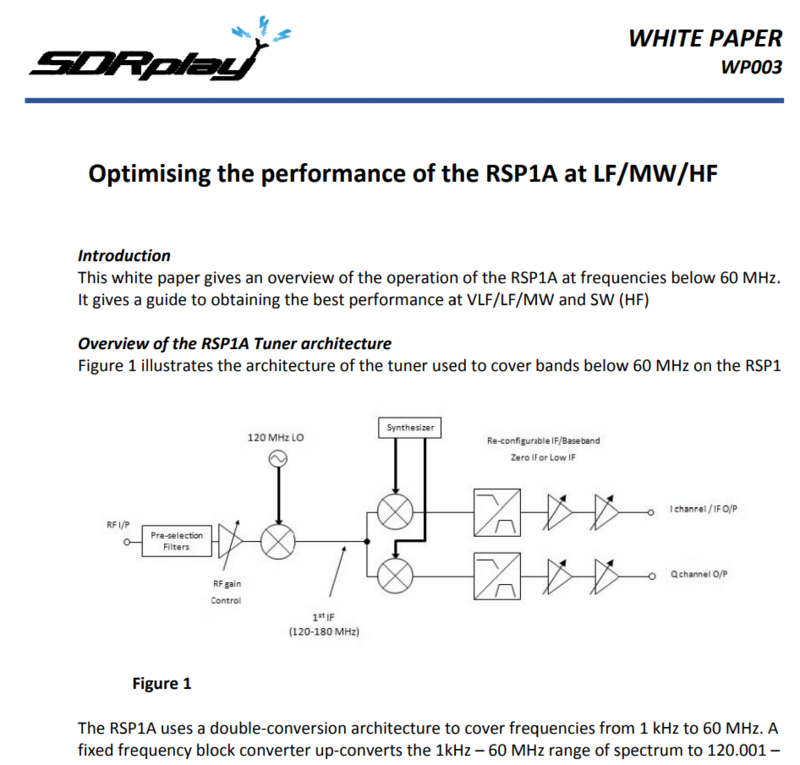 SDRplay have recently published an informative white paper that explains what intermodulation and higher order mixing effects are, and how they can affect reception on an SDR such as the SDRplay. This paper could be a useful introduction to understanding how to optimize reception of weak signals when they are in the presence of strong signals. While written for the SDRplay, the same knowledge and tips could be applied to any similar SDR. Later in the paper they also show how to eliminate intermodulation effects by enabling the MW/AM notch filters on the SDRplay RSP1A unit, and by carefully choosing the LO frequency. The RSP1A covers the spectrum from 1kHz to 2GHz, and phantom signals can be a menace for all wideband SDR receivers. More and more is being published about the most obvious culprit which is inter-modulation caused by very strong interferers such as MW/FM broadcast transmitters – indeed, all the current SDRplay RSPs have built in filters to help reduce the problems caused by that. But the reality is, particularly at HF and below, that a phantom signal may occur for other reasons such as higher order mixing effects. Sometimes, it can be difficult to know what is the cause of the phantom signal. If you can understand the cause, there are additional steps you can take to overcome it. We’ve just published this white paper to explain the difference between intermodulation and higher-order mixing effects, and what practical steps you can take to reduce the latter in particular. Our example uses an RSP1A operating at frequencies below 60MHz. First pager of the SDRplay whitepaper on intermodulation effects.